I grew up in the country with my parents, four brothers and one sister. Along with being outside and discovering the world around me, I loved books. I couldn’t wait to ride my bike up to the bookmobile and get my hands on another biography or mystery! Our family vacations were the best! These trips instilled a love for adventure in me. My family, on top of Sleeping Bear Dunes. I’m at the far left in the cool midriff number. 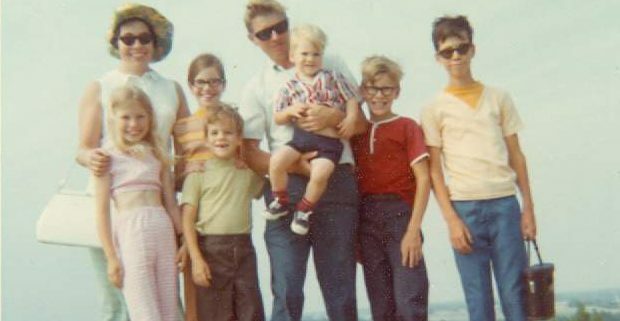 Along with my parents, I’m surrounded by my brothers Greg, Gordie, Jeff and Kevin and my late sister, Karen. As a little girl I’d stay up past bedtime, flashlight and stolen cookies in hand, devouring Nancy Drew stories and other mysteries. As a teenager I wrote for the high school paper and dreamed of working for a small town newspaper. One of my favorite stories from those years involved a haunted trail that a friend and I made. After college I worked for a radio station selling ad space. I loved writing commercials for clients. Several years later I worked in sales and management for the Toledo Convention and Visitors Bureau, and then for the convention center. I worked hard, traveled a lot, and had a blast! I met and married my amazing husband Brad. Two years later we had our first daughter Claire, and soon after that, daughter Kyle, and then our son Ian. 3 babies in 3 years. I quit my job. I loved being at home with my kids and taking them to the parks, the zoo, on nature hikes and the library. I wanted to share the world with them. 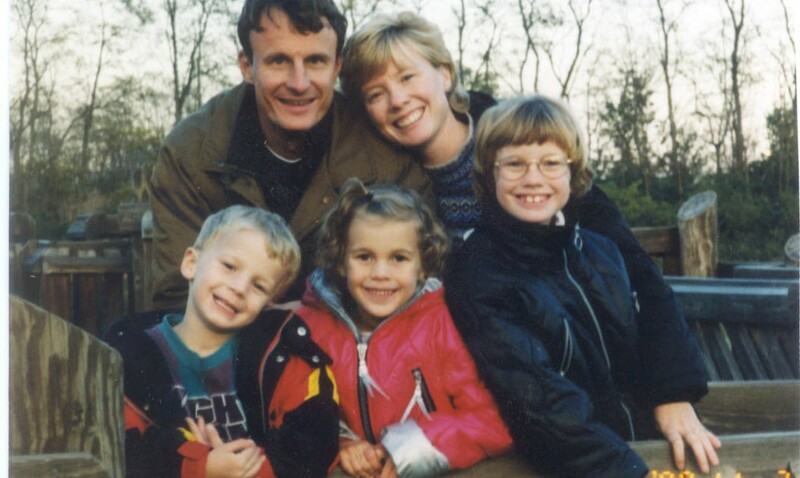 My husband Brad and I began our mission of experiencing all 50 states with our children. I still held onto my dreams of becoming a writer and began freelancing for local and regional newspapers and magazines. Sadly, when she was ten years old, our daughter Claire died unexpectedly due to a heart condition. We still miss her big smile, her impish spirit, her love for family and friends. She enjoyed dancing, playing softball, and telling stories. But most of all she was passionate about books! We created Claire’s Day to share this love with the community. What began as a one-day event, has expanded into multiple locations and many days filled with various literacy events. Each Claire’s Day is filled with the sights and sounds of children of all ages enjoying all that Claire held dear: books, music, fun hands-on activities, and celebrating special readers. We were even featured in Reader’s Digest! Through Claire’s Day I befriended many children’s book authors and illustrators and they literally drew me into their world. I became a published author! My works include biographies for middle-grade readers and currently working on, and pursuing other fiction and nonfiction opportunities. Look for Eye to Eye: Sports Journalist Christine Brennan in April, 2019, and a book for middle grade and young adults on human behavior! My latest work, Virginia Hamilton: America’s Storyteller is listed in the Bank Street College of Educations Best Children’s Books of 2018 with Outstanding Merit and received a Starred Review from Kirkus. I also read to kindergarten students through Read for Literacy’s Creating Young Readers program, and it is my absolute favorite thing to do. 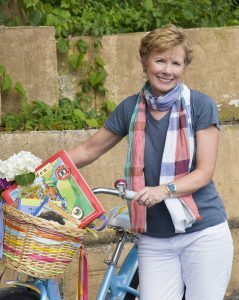 I’m still Just Julie though, as I’m not much different than that little girl who used to ride her bike to the bookmobile, stacking her basket with biographies and adventures. Now I write them and live them. To read of the most recent leg of my travels through life, see my journal. Learn about my latest writing project, visit the books section. Most of all, I would love to hear your story, or how you’ve connected with mine. Please feel free to write to me through email.